The key to getting a nice golden scallop is twofold: 1. The surface of the scallops must be really dry. 2. The oil in your pan needs to be hot. If you’ve got those two things going on, you’ll have success! And since scallops are so low in fat and calories, you have plenty of room for a bit of bacon. 1. Bring a large pot of salted water to a boil and cook the linguini according to the package directions. 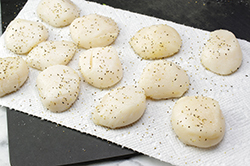 Pat the scallops dry with paper towels, then season them on both sides with the salt and pepper. 2. 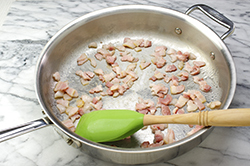 While the pasta cooks, cook the bacon in a large sauté pan over medium-high heat for 2 to 3 minutes, until the fat renders. Push the bacon to the side with a spatula and add the garlic. Cook the garlic for 1 minute and then add the scallops. Cook the scallops for 2 to 3 minutes on each side, until golden. 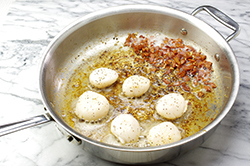 Transfer the scallops, garlic, and bacon to a platter and keep warm. Wipe the pan clean with a paper towel and set aside for use later. 3. 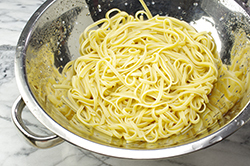 Drain the pasta, reserving 1/4 cup (60 ml) of the cooking liquid. 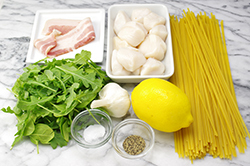 Add the reserved pasta water to the pan in which you cooked the scallops, along with the lemon juice. Cook over high heat for 2 minutes, until reduced by half. 4. 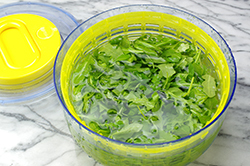 Into each of 4 shallow bowls, place 1 cup of the arugula and 1 cup of the hot linguini. 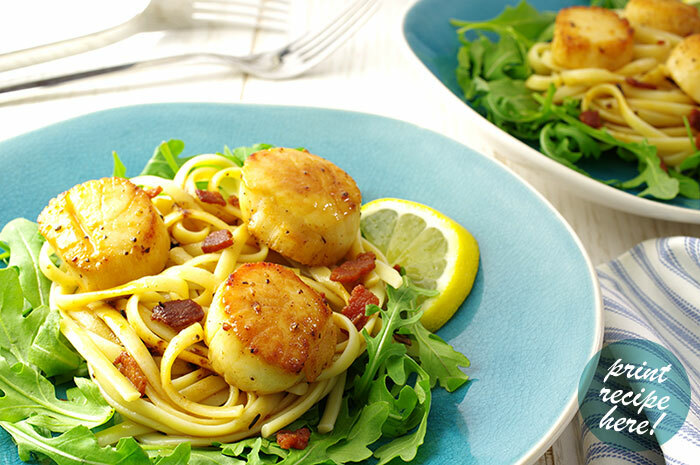 Top each serving with 3 scallops and some of the bacon, then drizzle with a bit of the pan sauce. Serve hot. NOTE: Center-cut bacon is the bacon that is cut from part of the pig that is closer to the bone and has 20 percent less saturated fat than regular bacon. I like using Niman Ranch Uncured Maple Bacon, which is center-cut bacon that does not have nitrates or nitrites added.